Daily book fair: Available to the general public, our used book sales area features modest prices and tables for browsing. Proctoring: Our Library provides proctoring by arrangement with our executive director. Fees are $25.00 per examination. Additional charges apply for return by certified mail. Book, audiobooks and DVD lending for library members. To become a member click here. *Evening rental requires additional security fees. San Juan Community Library has 30,000+ books, DVD’s and audiobooks in Spanish and English divided in different collections. To view our online catalog, visit catalogsjcl.org or use the link below. Oversize Books Collection - More than 300 books in diverse genres; with many in Art. Elie Frieband Memorial Collection - Named in honor of a library volunteer, this special collection focuses on Young Adult fiction. 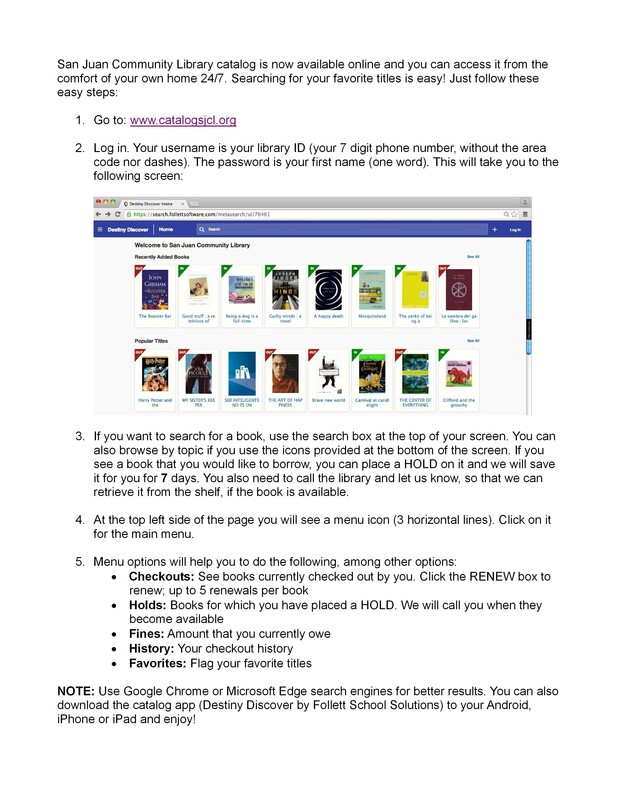 A library catalog is available in any of the library computers or from the comfort of your own home. Click here to search our catalog. For instructions of how to access the catalog please click here. If you need to renew your library books and can not reach us by phone, please send us an email at info@yourlibrarysanjuan.org. 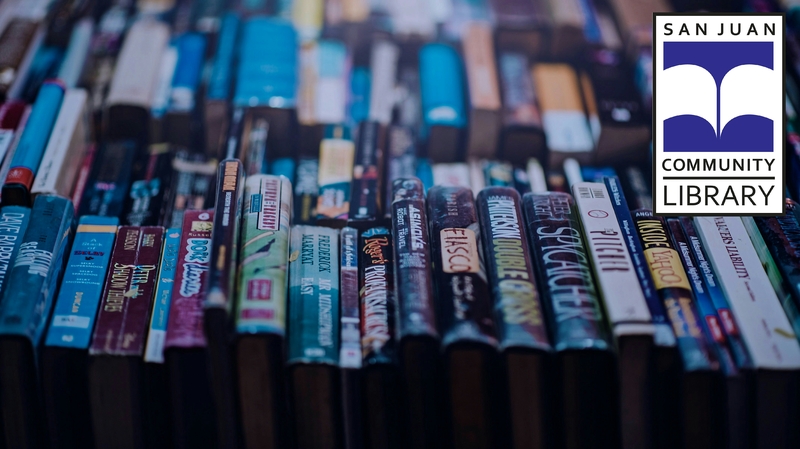 We have partnered with OverDrive and library supporters to bring to you more than 1,000 purchased titles and 53,000 additional titles in the public domain. From our virtual branch you may download ebooks and audiobooks to your desktop, laptop, or mobile device including iPhone, iPad, Android, Kindle, and other mobile devices. Click here for a list of supported devices. To visit San Juan Community Library anywhere/anytime, log onto our virtual branch at www.digitalsjcl.org. Current library members will be able to use their library membership number to download ebooks and audiobooks for two-week loans with no late fees. OverDrive is a leading source for virtual lending collections to public libraries and schools on a worldwide basis. The launch of our virtual branch was a great way for us to mark our 25th anniversary in 2012. Join us as we join libraries around the world whom are making it possible for their patrons to use their library anytime from any location. Join our library online here (allow 48 hours for your digital library membership to become active). Call us or email us with any questions at (787) 789-4600, and info@yourlibrarysanjuan.org. You can also come by the library on Tuesdays, Wednesdays or Fridays and our volunteers can assist you. For specific downloading instructions click here.